A new geoengineering paper proposes to use the net negative feedback of clouds to lower sea surface temperatures in hurricane prone areas by "up to a few degrees" to allegedly reduce hurricane intensity by a category. They are one of the most destructive forces of nature on Earth, but now environmental scientists are working to tame the hurricane. In a paper, published in Atmospheric Science Letters, the authors propose using cloud seeding to decrease sea surface temperatures where hurricanes form. 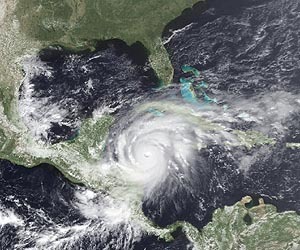 Theoretically, the team claims the technique could reduce hurricane intensity by a category. The team focused on the relationship between sea surface temperature and the energy associated with the destructive potential of hurricanes. Rather than seeding storm clouds or hurricanes directly, the idea is to target marine stratocumulus clouds, which cover an estimated quarter of the world's oceans, to prevent hurricanes forming. "Hurricanes derive their energy from the heat contained in the surface waters of the ocean," said Dr Alan Gadian from the University of Leeds. "If we are able to increase the amount of sunlight reflected by clouds above the hurricane development region then there will be less energy to feed the hurricanes." Using a technique known as Marine Cloud Brightening (MCB), the authors propose that unmanned vehicles could spray tiny seawater droplets, a good fraction of which would rise into the clouds above, increasing their droplet numbers and thereby the cloud reflectivity and duration. In this way, more sunlight is bounced back into space, thereby reducing sea surface temperature. The team's calculations, based on a climate ocean atmosphere coupling model (HadGEM1) suggest this could reduce the power of developing hurricanes by one category. Somewhat different cloud-seeding projects, designed to directly influence rainfall amounts, already exist around the world and were most famously used in China during the 2008 Beijing Olympics. "Data shows that over the last three decades hurricane intensity has increased in the Northern Atlantic, the Indian and South-West Pacific Oceans," said Gadian. "We simulated the impact of seeding on these three areas, with particular focus on the Atlantic hurricane months of August, September and October." The calculations show that when targeting clouds in identified hurricane development regions the technique could reduce an average sea surface temperature by up to a few degrees, greatly decreasing the amount of energy available to hurricane formation. "Much more research is needed and we are clear that cloud seeding should not be deployed until we are sure there will be no adverse consequences regarding rainfall," concluded Gadian. "However if our calculations are correct, judicious seeding of maritime clouds could be invaluable for significantly reducing the destructive power of future hurricanes." This paper examines the potential to cool ocean surface waters in regions of hurricane genesis and early development. This would be achieved by seeding, with copious quantities of seawater cloud condensation nuclei (CCN), low-level maritime stratocumulus clouds covering these regions or those at the source of incoming currents. Higher cloud droplet density would increase these clouds' reflectivity to incoming sunlight, and possibly their longevity. This approach is therefore a more localized application of the marine cloud brightening (MCB) geoengineering technique promoting global cooling. By utilizing a climate ocean/atmosphere coupled model, HadGEM1, we demonstrate that—subject to the satisfactory resolution of defined but unresolved issues—judicious seeding of maritime stratocumulus clouds might significantly reduce sea surface temperatures (SSTs) in regions where hurricanes develop. Thus artificial seeding may reduce hurricane intensity; but how well the magnitude of this effect could be controlled is yet to be determined. We also address the important question as to how MCB seeding may influence precipitation. GCM modelling indicates that the influence of seeding on undesirable rainfall reductions depends on its location and magnitude. Much more work on this topic is required. The problem I have with this is, as soon as you begin trying to modify an manipulate a natural process such as this, the next thing you know you have just produced a severe drought here in Tennessee. We rely on storms in the gulf to give us water. Hurricanes are a natural process, don't change them, deal with them!